The Evacuation of Anzac is universally regarded as a triumph, partly because it was casualty-free. Mention is sometimes made of a couple of wounded, but the implication is that nobody died. 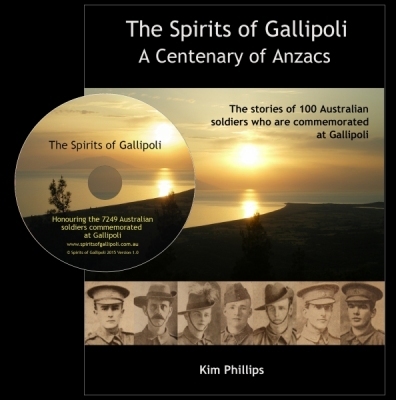 That’s what I thought too, until Kim Phillips asked me to write a foreword to her book The Spirits of Gallipoli – A Centenary of Anzacs. There I found that Staff Sergeant Harry Bowser of the 2nd Light Horse had died on 19 December, of wounds received on the beach, and was buried at sea. Harry was the last Anzac to die at Gallipoli, remembered on the Lone Pine Memorial. That’s the kind of new connection that can be made in this unique and extraordinary book and CD. The stories of 100 Anzacs are told in the book, and all available details of 7249 men who served in the Australian forces and who are buried or commemorated at Gallipoli are on the CD. The last Anzac die: Gallipoli 19 December 1915. They numbered 7429 – Australians buried or commemorated in the cemeteries or on the memorials at Gallipoli. The official number of dead is 8709 – the difference made up of those men who died of wounds, disease and are buried or commemorated elsewhere – Egypt, Australia, England, Malta. When Lieutenant C. E. Hughes of the Australian Engineers and the British Graves Registration Unit landed on Gallipoli in November 1918 they found that practically all the graves at Helles, and a significant number at Anzac had been desecrated – crosses removed and bodies dug up. Bean on his return with the Australian Historical Mission in 1919 recommended that the men be buried in 29 cemeteries as near as possible to where they fell, and Hughes and his team established the cemeteries we know today. Many of the originals wanted to be among the last to leave: they were there at the beginning, they wanted to be there at the end. Casualties, perhaps heavy, were anticipated among the rearguard if the deceptions were unsuccessful. The evacuation was a complete success. The Sydney Morning Herald noted ‘The removal of the troops with insignificant casualties is an operation for which the heartiest praise will be given … it has completely deceived the Turks.’ (SMH 22 December 1915, p 10). Bean mentions in the Official History that ‘on shore one man had been wounded, and a light horseman in one of the boats was hit by a stray bullet from the fusillade caused by the explosion of the mines’. The mines exploded at the Nek at 3.26 a.m. In his diary at 5.40 a.m. Bean notes ‘All Suvla stores burning. We had at least one man wounded. Turks still firing at Anzac’. Bean later clarified this a little in 1946 Anzac to Amiens (1946) Watching from the Grafton Bean saw ‘a brilliant orange glow twice flush for a moment the underside of low angry clouds’ and then ‘a growing rattle of rifle fire spread along the Turkish line – a bullet from this stream hit a soldier in one of the boats causing one of the two Anzac casualties of that night’. The implication is that these casualties were wounded; otherwise why would the ever-meticulous Bean not write that one or two were killed or died of those wounds? But one of the Anzacs named in the Centenary died on 20 December 1915. He was one of the two casualties mentioned by Bean. His name can now be recorded as most probably the last Anzac to die at Gallipoli. We do not know the name of the second man, and many others died as a result of illness or wounds received at Gallipoli, but this man was wounded on the beach, and died just off-shore, was buried at sea, and is remembered on the Lone Pine Memorial. He was Sergeant Harry Bowser, No. 661, 2nd Light Horse Brigade headquarters, assigned to Divisional headquarters as Staff Sergeant. He died on the H.S. (Hospital Ship) Dunluce Castle from gunshot wounds to the chest and abdomen, received in action on 19 December. He was buried at sea between Anzac and Mudros, and is remembered on the Australian Memorial at Lone Pine and on the ‘Winged Victory’ memorial at Marrickville. Harry Bowser was 24, born at Enfield NSW, educated at Petersham High School, an accountant who enlisted in 12 October 1914 and sailed with the second convoy on 21 December aboard the A29 Suevic. He was an active member of the Sydney YMCA, and was made the YMCA representative on the Suevic’s voyage to Egypt. He distributed books and magazines, quoits, dominoes, draughts, boxing gloves, punching balls, skipping ropes, two dozen singlesticks, Indian clubs and so on He played for YMCA in the second grade Rugby Union competition which won the 1914 premiership. Bowser converted two tries and kicked a penalty goal in the 20-11 win over Randwick. He scored 99 points for the season. There you have the beginning of the legend of the Anzacs, from the last to die. Kim Phillips’s devoted work in collecting all the available information of these great hearted men has been itself truly heroic, and The Spirits of Gallipoli: A Centenary of Anzacs will prove an invaluable tool for present and future researchers.